TAMPA, Fla. -- Sumter County Sheriff’s detectives credit a facial reconstruction sketch drawn by University of South Florida forensic anthropologist Erin Kimmerle as the key piece of evidence in solving a murder case from last year. “It’s truly a remarkable resemblance once you’re able to kind of put the pieces together,” said Sumter County Sheriff Detective Hofecker. In a recent press conference, Sumter Sheriff detectives detailed the investigation and shared the sketch with members of the media. The facial reconstruction sketch was effective in helping detectives determine the identity of the victim. After the remains were discovered in a wooded area off of Interstate 75 in April 2013, the sheriffs’ office reached out to Kimmerle and the anthropology lab at USF for assistance with the skeletal reconstruction. 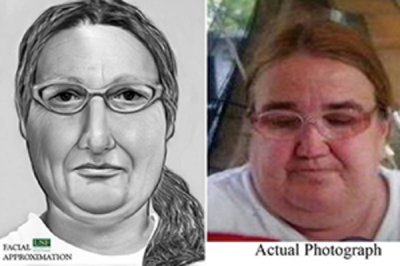 Kimmerle created the facial composite of the victim using Photoshop combining a 3D scan of the skull and evidence recovered from the scene, including eyeglasses and clothing. Graduate students from USF assisted Kimmerle with a detailed forensic anthropological examination of the victim. In November of 2013, investigators working on a missing persons case from Kentucky contacted Sumter detectives, noting that the sketch drawn by Kimmerle was a close resemblance to Martha "Jane" Wever and in fact, turned out to be the victim. Wever was the youngest of 14 children. Her brother Dale Sturtz, a retired sheriff and his wife traveled from Michigan to show their gratitude to Kimmerle and law enforcement officials for solving the case. Sumter detectives arrested Ralph Penrod for Wever’s murder and are holding him without bail. Kimmerle and the USF forensic anthropology lab conduct these types of reconstruction methods on all cases that come through the lab and have expressed interest in applying the techniques to help solve additional cases throughout central Florida. “That is exactly what we always say and our driving force is about providing peace and resolution to the families, and I think what the families talked about in terms of the dedication of the law enforcement agencies speaks to that, too,” Kimmerle said. For more information on cold cases currently being investigated by the USF forensic anthropology lab visit the lab’s Facebook page.